Well, actually, I quite like it. What's it doing here then? Well, it's really quiet, especially when compared with parts of the M8! It's a motorway of contrasting scenery - sometimes it's in a cutting, other times it winds its way between the hills and it also heads over plains. It has the tightest bend on a British motorway that isn't part of a junction complex, it's also the most northerly part of the British motorway network, and it's the only rural motorway to be built without hard shoulders in places. That's right. And believe me, it feels really, really odd. There are emergency lay-bys every mile, though. And the last thing - it killed the M85, and so now there are two M90s at the northern end. One is signed as (A9) and the other as (A90). It seems quite daft to me, but there you go. Just be aware that low sun and a streaky windscreen don't make the best combination! All those scenery shots - and why not? I have to say from experience that it is a very scenic motorway indeed. Of course, the notable thing about the Broxden spur is it actually longer from where it goes off than the remainder of what they have us believe is the M90 proper. It does mean that the most northerly motorway has no number to call its own - though if the M85 were restored, this could indeed be the M90 again. It's true that the stretch with the concrete surface is unusually noisy, but apparently that surface is lasting far better than the tarmac used elsewhere. 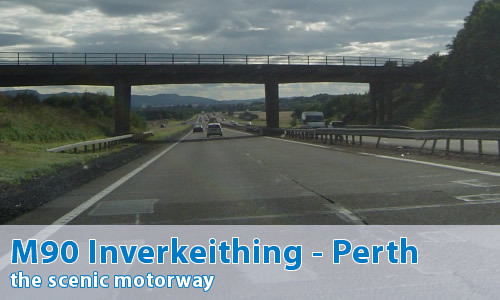 As for the M90 being really quiet: over much of its length it is, but between junctions 1 and 3 it's like a racetrack. The southern section of the motorway, from junction 3 to the bridge is very busy. To make matters worse if you are heading northbound you are heading up a rather steep incline, creating a dangerous speed differential between light and heavy vehicles. It's not unusual to have to slow from 70mph to around 30mph if one HGV pulls out to overtake another. Hopefully they will widen this section of the road as part of the New Forth Crossing scheme.